So, the lovely Leanne over at DoNotRefreeze tagged me with this award about a month ago. I forgot it, then remembered it, then forgot it, then… you get the idea. This time, I remembered and decided to get it did before it slips out my bird brain again! -You have to put a song that makes you happy. – You can tag as many people as you like, there is no limit. 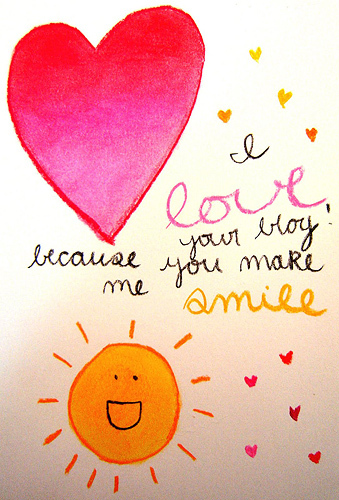 – Say at least one thing about each blog you tag, that will make them smile, something nice about their blog that makes you smile when you read it! I <3 Janis, for nearly two years I had this set on my clock radio to wake me every morning. The lovely Jo @ Music and Makeup, my obsessions! She posts some gorgeous Nails of the Week (has a bit of a thing for purple!) I met her all too briefly at the Illamasqua event and hope I get to meet her again in the not too distant future for a better chat! A blog I’ve only recently discovered… Dottie has some great style (leopard print alice bands) and a new-found flair for nail art! Check her out! Love her scatty train of thought and eclectic posts that are always charming to read. She’s super cute too! I’m a bit nail polish oriented in my tags.. but check Kae out, don’t miss her latest gorgeous green franken! She’s always rocking some gorgeous concoction on those beautiful tips of hers! Maria @ Polishign the Nails! Another nail fanatic! She really made me laugh with her “then and now” post on nail polish application – looks like mine before clean up! She does more posts in English now so I can understand them hurrah! And she totally has me lusting after those rose rings she bought on etsy!